Omar Khayyam is one of my heroes. I have read translations of his poem, the Rubaiyat, hundreds of times over the past 50 years. Amazingly, each repetition still brings some fresh insight! Rubai means “quatrain,” a four-line stanza in which there are two sets of rhyming lines. The Rubaiyat is a collection of quatrains written over a period of many years by Omar Khayyam, a Sufi mystic living in the late 11th and early 12th Centuries. What matter faith, unfaith, obedience, sin? Thou’rt all we need, the rest is vanity. Unvexed by hopes of heaven or fears of Hell. Omar had the good fortune to live in Nishapur, a prosperous city on the Silk Road, at a time when the Moslems had ruled Iran for 500 years. Significantly, a large minority of followers of the Zoroastrian religion whom Omar called “Magians” still resided in this area. He was also acquainted with the beliefs of smaller religious minorities in the region – Jews and Christians, as well as Buddhist travelers. In his poem, he shows respect for all of these religions. He recognizes that ALL yearn for God – that all are seeking the ONE. Are all but divers tongues of world-wide prayer. While any monotheist may become a Sufi, they are most often associated with Islam. Ultra-orthodox Sufis may choose to obey Islamic law but add some mystical component. Other Sufis (like Omar) view Islamic law much the way Jesus viewed the ritualistic Jewish Law – that it is more important to obey the spirit than the letter of the law. Consequently, Omar was admired by someSufis who used his poem as a teaching tool but, like Jesus, he was cursed by those who were victims of his barbed criticisms of religious hypocrisy. In another behavior reminiscent of Jesus, Omar openly associated with sinners. Both believed that God wants us to speak, act, and live from our hearts. Yea, drink, and even rob, but oh! Be kind! 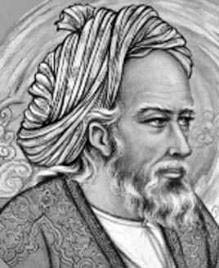 Omar was a scientist, astronomer, and mathematician. Everyone who has ever taken algebra has been taught his binomial theorem! As an astronomer, he revised the Persian calendar to be as accurate as our present Georgian calendar, but he did so 500 years earlier and without the use of telescopes! However, my favorite translator is E. H. Whinfield because of his effort to balance the meaning of the poems with a pleasing rhythm. While keeping the words as literally accurate as possible, he takes enough “poetic license” to insure that the poems remain beautiful when read aloud. Whinfield made 3 translations of the Rubaiyat. His second translation was selected by Joseph Campbell for the epic series, The Masks of God, so I assume that Campbell favored this translation too. Contrary to what you may have assumed when you were exposed to the Rubaiyat as an adolescent, the poem is NOT about living for the moment without regard for tomorrow! Omar does not advocate irresponsibility, but he does want to persuade people to BE ALIVE IN THE MOMENT – to enjoy what we have today –NOW! He is addressing those who live “in the past” or those who imagine that happiness is not possible until some imagined goal is achieved or current problem resolved! Nor make too sure another breath to borrow! Omar’s respect for the insight of other religions includes the “middle way” of Buddha and Lao Tzu which asserts that it is best to live modestly – shunning poverty or wealth. Like Jesus who told us that “the Kingdom of God is within you,” Omar claims that one can attain mystic union with God in the “here and now.” This is the universal insight repeated by all mystics throughout the ages. When our primary goal is to truly seek and love God, we are joined by persons from a diversity of religious affiliations, and academic arguments on textual minutia become irrelevant. Sow not this empty chaff their heart to fool. From words to “states” you may perchance be brought. Than pray in mosques and fail Thy face to see! ‘Tis Thine to burn, and Thine to cherish me! Where have I said that wine is wrong for all? “Tis lawful for the wise, but not for fools. In all Abrahamic religions (Judaism, Christianity, and Islam), there is tension between GOOD WORKS and GRACE as the basis for Salvation. Is Heaven earned by good works or does God’sunconditional love insure our place in Heaven? Another paradox involves EVIL: If God is all- powerful, why does evil endure? Adam from Paradise why banished He? In grace hard-earned by works no grace I see. #46 Khayyam! Why weep you that your life is bad? What boots it thus to mourn? Rather be glad. Mercy was made for sinners – be not sad. Is it then just to punish me in Hell? One of the recurring analogies in Omar’s poetry is God as “potter” and humankind as “pots.” Literally, we are made of dust, and to dust we return. Omar reminds us that the clay in our earthenware cup could, in the past, have been human! And bonds of beauty’s tresses once embraced. Has many a time twined round a slender waist! you wot not whence you come, nor whither go. O Khayyam, have you fathomed what man is? A magic lantern with a light therein! Allah! Of what clay didst thou form me so? No hopes have I above, no joys below. Those Christian bells and stoles I would not scorn. I gird me with the Magian zone, and why? For shame so poor a Moslem to be. #334 Am I a wine-bibber? What if I am? Zoroastrian or infidel? Suppose I am? I am my own, and what I am, I am. But, if that veil be lifted, where are we? Our eyes are blinded that we may not see! Sinner! Despair not, but His mercy trust! Tomorrow He’ll absolve your crumbling dust. #318 Sure of thy grace, for sins why need I fear? How can the pilgrim faint whilst Thou art near? And all my “black record” will disappear. Our Friend will sternly judge, and doom to hell. Can aught but good from perfect goodness come? Compose your trembling hearts, ‘twill all be well. O Thou who dost accept the pleas of all! Like us, Thy intimates, who nigh Thee dwell? Say that to strangers, we know Thee too well! This last verse refers to mystical insight in which the knowledge of God is gained directly. Like mystics and Universalists everywhere, Omar knows that in the end, we will ALL be united with God.